It is a complete treatment which helps you restore your skin's balance and clears blemishes while preventing appearance of future discoloration. A unique formulation containing precious herbal & botanical extracts that helps to remove blemishes & acne scars and lightens pigmentation. 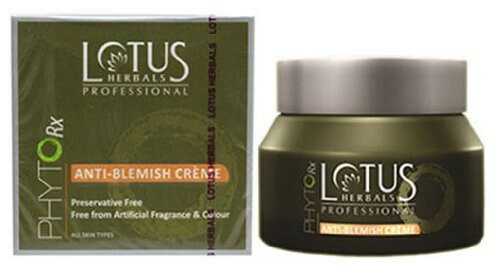 This creme with blemish fighting ingredients is safe for sensitive skin.Lotus Herbals Professional Phyto-Rx Anti Blemish Crèmeis made of concentrated botanical extracts which are not just safe but also highly effective. This ant-blemish crème is fortified with papaya extracts which lighten your skin tone, treat blemishes and scars and give your skin a gorgeous natural glow! No more hiding behind layers of concealer, look your gorgeous best with glowing, blemish-free skin! I bought this for my sister after reading the reviews here. It definitely works. I can see the difference in my sister's face and the blemishes have reduced! Even I use it and my skin feels soft , smooth and clean. It's not sticky and gets absorbed in the skin very well.